I have been married to Sally for 20 years, and we have two daughters: Zoe 18 and Jaymee 13. I now live in Chessington, a few minutes from the old ground. I Lived in Putney and attended Wandsworth school from 11-18 where initially I was made to play rugby and spent about 3 years trying to avoid it. Eventually I decided it was easier to play and try and enjoy it, a decision that was to shape my life. After leaving school I worked at Imperial College life science department where I stayed about 12 years. At the same time I and many others joined Old Wandsworthians RFC and soon became involved in the social side of the club which involved drinking lots of beer, mainly thanks to Chris Munton and pals. I was fortunate to play my early rugby in the lower sides with many great players such as Bill Forrester and Derek Finch in various Ian Maclean’s teams… all happy to welcome and coach us new players in the art of old boy rugby. After a few months I progressed up the sides into the 1st XV where I have played most of my rugby and carried on learning from other great players like John Totham, Pete Dutch and Tony Watts and then later with Alan Bone and Steve Lake. 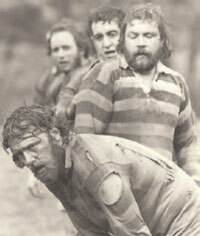 I also played Rugby Netball on Clapham Common in the summer months in the late Micky Brown’s team, the Old Blues. I managed to blag my way into combined London Old Boys XV for a short lived career: 1 game, 1 game lost. I left Imperial College in the early 80’s to run Clowns Cocktail Café. in Putney with Roger Hayward and Chris Munton, probably the most enjoyable time anyone could have working for a living. In the late 80’s I left Clowns and became a butcher and am now running my own catering butcher business supplying restaurants etc. Over the years I have played in just about every position, mainly prop in the tight and scrum half in the loose!!! I have held virtually all positions on the committee (never treasurer!!!) This season I am President and Head Coach. The club has survived and stayed virtually the same over the years, mainly thanks to a few people who, against the odds, kept it going. People like Dennis Norgan, who did more than his share during some very difficult times. We are now seeing the new generation coming through, still with the club at heart. I have now virtually finished playing (one or two games left I hope). I have mentioned some people by name but there have been too many to name them all. Some great players, some not so great and some very bad ones, but all with a place at the Dubs. So to everyone that I have had and still have the pleasure of knowing, thank you for making the Wandsworthians such a great club.